Female chauri bearer attendant on a Naga shaded figure like W. gate (Plate LIV). bl.uk > Online Gallery Home	> Online exhibitions	> Asia, Pacific and Africa Collections	> Female chauri bearer attendant on a Naga shaded figure like W. gate (Plate LIV). Pencil drawing by Frederick Charles Maisey of a figure of a female chauri-bearer carved on the south gateway of the Stupa of Sanchi, from an album of 60 drawings dated 1847-1854. 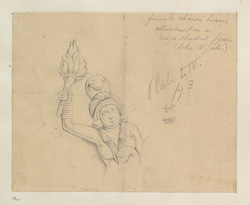 This drawing depicts a female figure of a chauri bearer attending on a naga or serpent-hooded figure. This figure is carved on the south torana or gateway of the great Stupa of Sanchi, the finest example of monumental architecture of the Shunga era. Situated in a peaceful and meditative site crowning a hilltop, Sanchi was ideally located in proximity to the prosperous city of Vidisha. The foundation of this monastic centre were laid by the emperor Ashoka (reigned 269-232 BC ca.) who built the original stupa (Stupa1) and erected a monolithic pillar in the third century BC. The stupa was later enlarged and encased in stone around the1st century BC under the Shungas and four magnificently carved gateways called toranas were added at the cardinal points. These consist of square posts supporting three curved architraves with scrolled ends, all covered with sculptures illustrating episodes from the Jatakas (legends about the previous lives of Buddha) as well as stories from the historical Buddha.